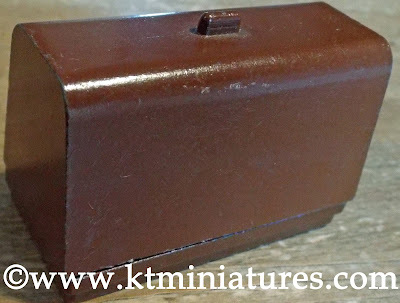 Back on the 8th September 2010 I put up a posting on KT Miniatures' Journal titled "A Miniature Version Of A Hoover 262 Vacuum Cleaner - Made By DCA". 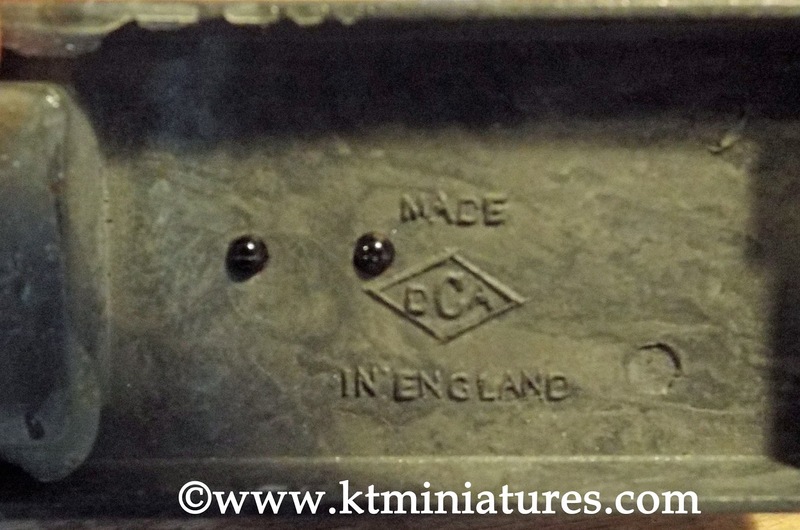 Basically, the blog posting was about a miniature 1/12th scale DCA Hoover that had just gone up for sale on KT Miniatures' website. 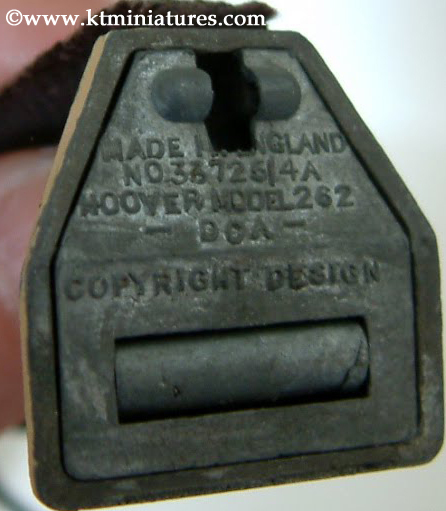 Above you can see photos of that very same vacuum cleaner with the manufacturer information and model description embossed on the underside, which is how we know this is a Hoover Model 262. If only all other manufacturers of dolls house miniatures included such concise information on their products, it would make identifying them far easier for us! A quick internet search revealed that this particular real life sized Hoover 262 model was first manufactured in 1939 and then again after the war by Hoover from 1945 to 1949. 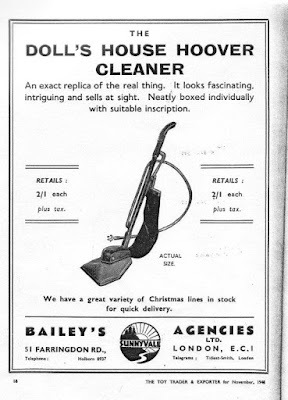 Also included in the original blog posting, was this advert that was kindly supplied by Marion Osborne from the TOY TRADER & EXPORTER dated November 1948, showing us that the little Hoover was being sold by Bailey's Agencies in London. Up until then I had assumed that it had been manufactured in the 1950s, so it was interesting to see that it was actually available a little earlier in the post war 1940s. DCA stands for DieCast Alloys Company which began in 1945 in London and was run by Malcolm's father - Leonard Ambridge, along with two other partners - Arthur Searle and Eric Webb. Arthur was a toolmaker like Leonard, and Eric looked after the paperwork and administrative side of things. Their first premises were in Corsham Street, Shoreditch, and then during the mid 1950's they moved to Orsman Road in Hoxton. 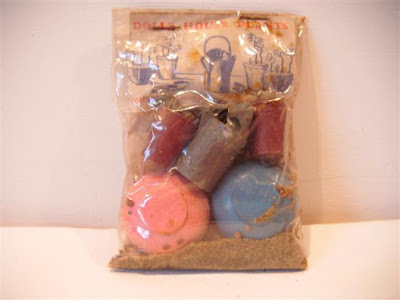 Malcolm was quite young at this time and although he can remember many of their toys and products, he cannot be accurate about dates and therefore cannot say exactly when DCA started making toys, but he guesses that it would probably be around 1946. He thinks that the production of the miniature toys most likely came about in response to a commission from either an agent or wholesaler. 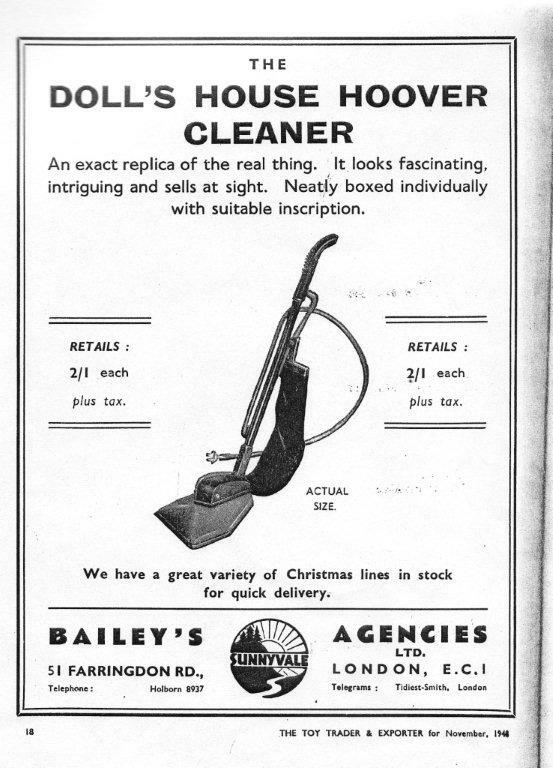 Interestingly, Bailey's Agencies (who were advertising the vacuum cleaner in the Toy Trader and Exporter) was based in Farringdon Road which is extremely close to Corsham Street, so we can't help but wonder if Baileys may have been the company that initially commissioned the miniatures? After Malcolm's initial email, needless to say several communications then ensued between us and he sent me further information, including photos and images. 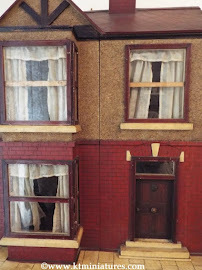 In clearing out his loft, Malcolm came across one of the DCA miniature vacuum cleaners in its original box, plus a DCA Dolls House Plant Set. In the above photo, you can see Malcolm's DCA Hoover and accompanying box. Rarely do we come across this little vacuum cleaner in such immaculate condition, let alone the box, so it is a real treat to see. 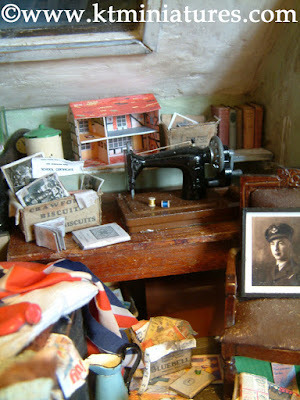 Malcolm remembers there being a DCA sewing machine but doesn't have one amongst his collection. I may no longer have a DCA vacuum cleaner (all have been sold) but I do have a sewing machine, and although it was fixed in my Old Attic Scene, for purposes of this feature I have managed to prise it out of situ in order to photograph it close up. I love this little DCA sewing machine, probably because it reminds me of my mother's old late 1940s Singer sewing machine on which I spent many happy hours learning the art of dressmaking as a teenager. One observation though is that it is slightly larger than a traditional 1/12th scale. 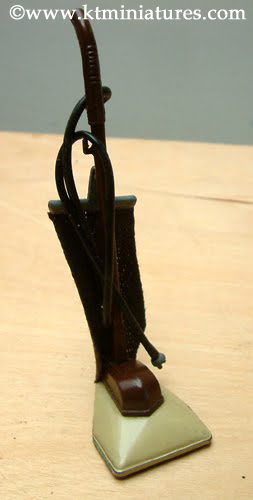 The base of the machine measures 2 1/4" long x 1 1/8" deep and it stands at a height of 1 3/8". With the cover in place, this entire piece stands at an overall height of 1 1/2". 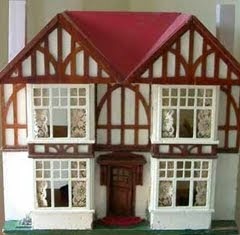 For many of us who collect old dolls houses and their contents, scale is often all over the place. And although my little old attic scene did initially start off as a 1/12th scale project, various vintage bits and bobs started finding their way in too, so now I have thrown caution to the wind and am just filling it with things that I like regardless of their size, hence the sewing machine looks well at home in there! 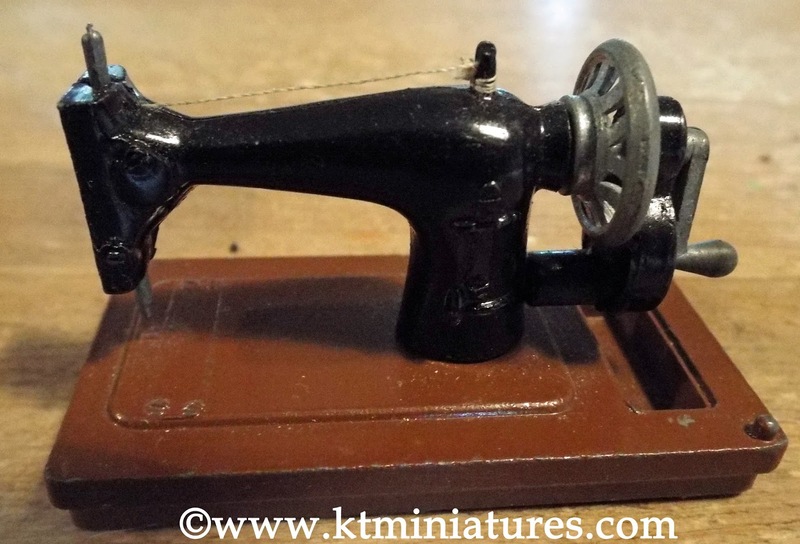 I have heard some people refer to this as a "Jones" sewing machine but nowhere is it marked as such, (unlike the vacuum cleaner that was clearly a replica of a specific branded product). 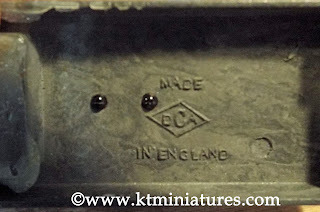 Instead underneath the machine it simply states MADE IN ENGLAND and has the DCA diamond logo. Just for my own interest, I have been doing a little research into post war 1940s sewing machines but I've not been able to find a specific real life size model that exactly resembles this DCA model. So perhaps it was just loosely designed on sewing machines that were generally around in post war 1940s? 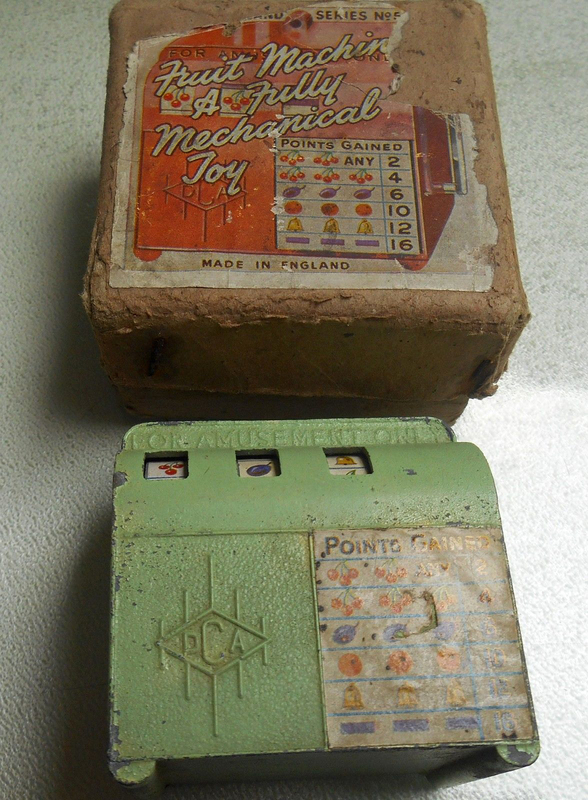 UPDATE: Many thanks to Marion Osborne who has got in touch since this feature went live, to tell me that she has seen a DCA Sewing Machine with accompanying original box that has "Jones Sewing Machine" printed within the wording on the side. Not only that, I have now seen a photo of that elusive lid! It consists of a tiny long rectangular unpainted metal plate with a centrally placed knob handle, and the whole lid slots neatly into the little recess within the sewing machine base. Special thanks to Bob (Ebay Seller Name: Dorothy195209) for kind permission to use this image. Malcolm went on to tell me that he remembered there being a toy DCA Fair-land Ring The Bell game but did not have one amongst the collection up in his attic. So again, through the magical power of the internet, I was led to an Ebay advert where Bob (Ebay Seller Name: Dorothy195209) had one for sale just before Christmas 2015. He has very kindly given me permission to use this photo of his lovely toy, which I understand is fully intact and stands at a height of approx. 5 1/14". I never knew that this toy existed either, it must be quite rare! There appears to be a metal mallet which I assume you use to bash the metal button on the base as hard as you can, in order to make the metal gauge to shoot up with the intention of ringing the bell......just like a life size one of these. Sounds great fun! For a short while DCA also produced a pocket sized functioning toy fruit machine. 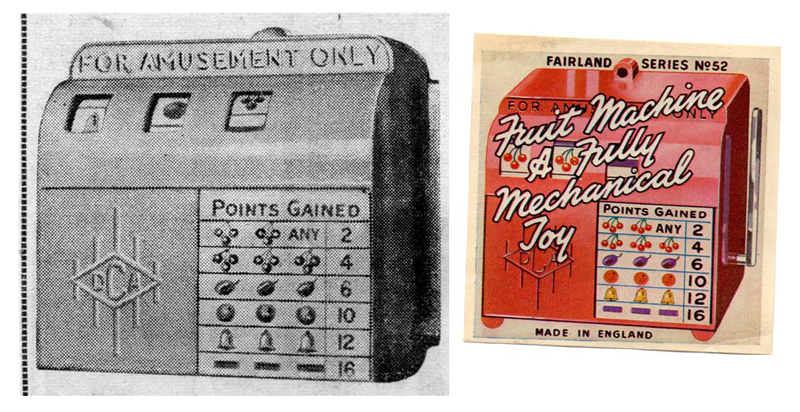 Apparently it was not successful and one of the factors suspected of contributing to its demise, was that at that time (post war 1940s) the Church Of England deemed that a toy miniature fruit machine would be a bad influence on children. So consequently the product received some adverse press! The black and white picture, seen above left, is a copy from a newspaper article dated 1947. 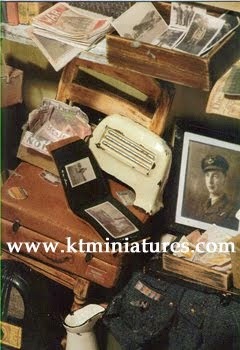 The coloured photo above right, is a copy of a label used on the fruit machine's carton. 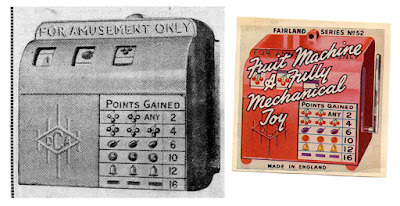 The two images above show coloured labels used on the fruit machine. Each column of fruit seen in the image on the left, had to be cut into a strip and stuck around the wheel. One of these labels shown on the above right image, would have been fixed to the front of the machine. Special thanks to John (Ebay Seller Name: Howardscarlet) for kind permission to use this image. After yet more researching on the internet, I managed to find an actual image of the miniature DCA Fruit Machine. Special thanks to John (Ebay Seller Name: Howardscarlet) who sold the tiny fruit machine last year on Ebay. It measures approx. just under 2 1/2" wide and tall. In John's image, you can also see the accompanying box too. Like the "Ring-The-Bell" toy, I suspect that this is incredibly rare nowadays. Malcolm told me that due to the Korean War which started in 1950, an embargo was placed on the use of zinc metal for toys for the duration and he thinks that it may have been this that halted DCA's toy production. So there we have it, DCA's venture into the toy market did not last that long, and by the 1950s their main die-casting business was of a more commercial nature until it's sale in 1975. Although for many years, they produced the wheel bearings for Mobo Toys. In fact, Malcolm says that they produced so many (some 20 million) that this was the only mould they had to re-make as the first one could no longer be maintained. As a point of interest, Malcolm's uncle (his father's brother) was called Sidney Ambridge and he was co-founder and Managing Director of Die Cast Machine Tools Ltd. (DCMT), well known for their Lone Star Toys. Inevitably, this led to me to question if this would be the very same company that made the wonderful DCMT metal dolls house cookers that are so familiar to vintage dolls house collectors? This query was soon answered, as Malcolm was able to tell me that DCMT made the mould tools for another toy company called Crescent Toys, who then diecast the cooker. As you can see from the example above, the cooker doors are marked DCMT CRESCENT and up until now, I had somehow always assumed that DCMT and Crescent were the same company - so this is all very interesting. Malcolm went onto tell me that there were a few toy diecasting companies in North London who would occasionally use one another's resources. In fact he can remember an occasion that DCA cast toy wheels for DCMT when they needed extra foundry facilities. Well, I hope that you have found the above fascinating and informative - we certainly know a bit more about DCA now! Once again I must offer my huge heartfelt thanks to Malcolm Ambridge for not only contacting me with this information in the first instance, but also taking the time to photograph and seek out the relevant images for me, and then allowing me to use them so publicly on here. Also, thank you to Bob and John from Ebay, and to Marion Osborne for permission to use their images. 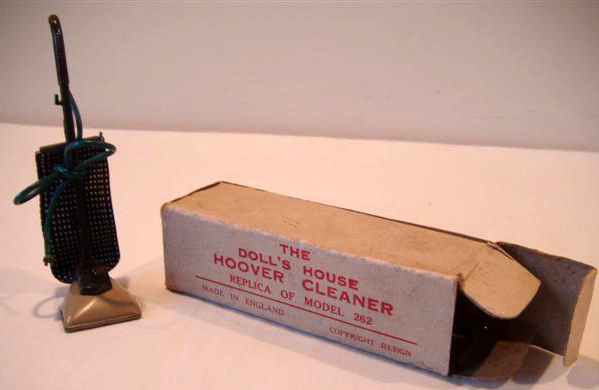 SPECIAL NEWS: Malcolm Ambridge has kindly pledged to donate his DCA Boxed Hoover 262 and his rare DCA Dolls House Plant Set to the Breast Cancer Now charity. 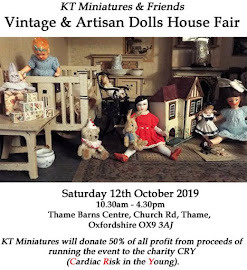 Both items will be available to purchase from KT Miniatures stand at The Thame Dolls House & Miniatures Fair on Saturday 27th February 2016. All proceeds from the sale of these two DCA miniature items will be in aid of Breast Cancer Now and they will be sold on a first come, first serve basis.